This article is about the financial term. For other uses, see Speculation (disambiguation). "Speculator" redirects here. For the Montana mining incident, see Speculator Mine disaster. For the village in New York, see Speculator, New York. For the archaic tactic in rugby, see Field goal (rugby). Speculation is the purchase of an asset (a commodity, goods, or real estate) with the hope that it will become more valuable in the near future. In finance, speculation is also the practice of engaging in risky financial transactions in an attempt to profit from short term fluctuations in the market value of a tradable financial instrument—rather than attempting to profit from the underlying financial attributes embodied in the instrument such as capital gains, dividends, or interest. Many speculators pay little attention to the fundamental value of a security and instead focus purely on price movements. Speculation can in principle involve any tradable good or financial instrument. Speculators are particularly common in the markets for stocks, bonds, commodity futures, currencies, fine art, collectibles, real estate, and derivatives. Speculators play one of four primary roles in financial markets, along with hedgers, who engage in transactions to offset some other pre-existing risk, arbitrageurs who seek to profit from situations where fungible instruments trade at different prices in different market segments, and investors who seek profit through long-term ownership of an instrument's underlying attributes. With the appearance of the stock ticker machine in 1867, which removed the need for traders to be physically present on the floor of a stock exchange, stock speculation underwent a dramatic expansion through the end of the 1920s. The number of shareholders increased, perhaps, from 4.4 million in 1900 to 26 million in 1932. The view of what distinguishes investment from speculation and speculation from excessive speculation varies widely among pundits, legislators and academics. Some sources note that speculation is simply a higher risk form of investment. Others define speculation more narrowly as positions not characterized as hedging. The U.S. Commodity Futures Trading Commission defines a speculator as "a trader who does not hedge, but who trades with the objective of achieving profits through the successful anticipation of price movements." The agency emphasizes that speculators serve important market functions, but defines excessive speculation as harmful to the proper functioning of futures markets. According to Benjamin Graham in The Intelligent Investor, the prototypical defensive investor is "...one interested chiefly in safety plus freedom from bother." He admits, however, that "...some speculation is necessary and unavoidable, for in many common-stock situations, there are substantial possibilities of both profit and loss, and the risks therein must be assumed by someone." Thus, many long-term investors, even those who buy and hold for decades, may be classified as speculators, excepting only the rare few who are primarily motivated by income or safety of principal and not eventually selling at a profit. Speculation usually involves more risks than investment. Let's consider some of the principles that explain the causes of shortages and surpluses and the role of speculators. When a harvest is too small to satisfy consumption at its normal rate, speculators come in, hoping to profit from the scarcity by buying. Their purchases raise the price, thereby checking consumption so that the smaller supply will last longer. Producers encouraged by the high price further lessen the shortage by growing or importing to reduce the shortage. On the other side, when the price is higher than the speculators think the facts warrant, they sell. This reduces prices, encouraging consumption and exports and helping to reduce the surplus. Another service provided by speculators to a market is that by risking their own capital in the hope of profit, they add liquidity to the market and make it easier or even possible for others to offset risk, including those who may be classified as hedgers and arbitrageurs. If any market, such as pork bellies, had no speculators, only producers (hog farmers) and consumers (butchers, etc.) would participate. With fewer players in the market, there would be a larger spread between the current bid and ask price of pork bellies. Any new entrant in the market who wanted to trade pork bellies would be forced to accept this illiquid market and might trade at market prices with large bid-ask spreads or even face difficulty finding a co-party to buy or sell to. By contrast, a commodity speculator may profit the difference in the spread and, in competition with other speculators, reduce the spread. Some schools of thought argue that speculators increase the liquidity in a market, and therefore promote an efficient market. This efficiency is difficult to achieve without speculators. Speculators take information and speculate on how it affects prices, producers and consumers, who may want to hedge their risks, needing counterparties if they could find each other without markets it certainly would happen as it would be cheaper. A very beneficial by-product of speculation for the economy is price discovery. On the other hand, as more speculators participate in a market, underlying real demand and supply can diminish compared to trading volume, and prices may become distorted. Speculators perform a risk bearing role that can be beneficial to society. For example, a farmer might be considering planting corn on some unused farmland. However, he might not want to do so because he is concerned that the price might fall too far by harvest time. By selling his crop in advance at a fixed price to a speculator, he is now able to hedge the price risk and so he can plant the corn. Thus, speculators can actually increase production through their willingness to take on risk (not at the loss of profit). 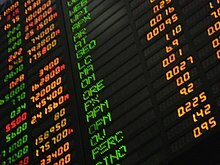 Speculative hedge funds that do fundamental analysis "are far more likely than other investors to try to identify a firm's off-balance-sheet exposures" including "environmental or social liabilities present in a market or company but not explicitly accounted for in traditional numeric valuation or mainstream investor analysis". Hence, they make the prices better reflect the true quality of operation of the firms. Shorting may act as a "canary in a coal mine" to stop unsustainable practices earlier and thus reduce damages and forming market bubbles. Auctions are a method of squeezing out speculators from a transaction, but they may have their own perverse effects by the winner's curse. The winner's curse, is however, not very significant to markets with high liquidity for both buyers and sellers, as the auction for selling the product and the auction for buying the product occur simultaneously, and the two prices are separated only by a relatively small spread. That mechanism prevents the winner's curse phenomenon from causing mispricing to any degree greater than the spread. Speculation is often associated with economic bubbles. A bubble occurs when the price for an asset exceeds its intrinsic value by a significant margin, although not all bubbles occur due to speculation. Speculative bubbles are characterized by rapid market expansion driven by word-of-mouth feedback loops, as initial rises in asset price attract new buyers and generate further inflation. The growth of the bubble is followed by a precipitous collapse fueled by the same phenomenon. Speculative bubbles are essentially social epidemics whose contagion is mediated by the structure of the market. Some economists link asset price movements within a bubble to fundamental economic factors such as cash flows and discount rates. In 1936, John Maynard Keynes wrote: "Speculators may do no harm as bubbles on a steady stream of enterprise. But the situation is serious when enterprise becomes the bubble on a whirlpool of speculation. (1936:159)" Keynes himself enjoyed speculation to the fullest, running an early precursor of a hedge fund. As the Bursar of the Cambridge University King's College, he managed two investment funds, one of which, called Chest Fund, invested not only in the then 'emerging' market US stocks, but to a smaller extent periodically included commodity futures and foreign currencies (see Chua and Woodward, 1983). His fund was profitable almost every year, averaging 13% per year, even during the Great Depression, thanks to very modern investment strategies, which included inter-market diversification (it invested in stocks, commodities and currencies) as well as shorting (selling borrowed stocks or futures to profit from falling prices), which Keynes advocated among the principles of successful investment in his 1933 report: "a balanced investment position... and if possible, opposed risks". It is controversial whether the presence of speculators increases or decreases short-term volatility in a market. Their provision of capital and information may help stabilize prices closer to their true values. On the other hand, crowd behavior and positive feedback loops in market participants may also increase volatility. The economic disadvantages of speculation have resulted in a number of attempts over the years to introduce regulations and restrictions to try to limit or reduce the impact of speculators. States often enact such financial regulation in response to a crisis. Note for example the Bubble Act 1720, which the British government passed at the height of the South Sea Bubble to try to stop speculation in such schemes. It remained in place for over a hundred years until repealed in 1825. The Glass–Steagall Act passed in 1933 during the Great Depression in the United States provides another example; most of the Glass-Steagall provisions were repealed during the 1980s and 1990s. The Onion Futures Act bans the trading of futures contracts on onions in the United States, after speculators successfully cornered the market in the mid-1950s; it remains in effect as of 2013[update]. The Soviet Union regarded speculation (Russian: спекуляция) as a criminal offence and punished speculators accordingly with fines, imprisonment, confiscation and/or corrective labor. Some nations have moved to limit foreign ownership of cropland to ensure that food is available for local consumption, while others have leased food land abroad despite receiving aid from the World Food Programme. In 1935 the Indian government passed a law allowing the government partial restriction and direct control of food production (Defence of India Act, 1935). It included the ability to restrict or ban the trading in derivatives on food commodities. After achieving independence in 1947, India in the 1950s continued to struggle with feeding its population and the government increasingly restricted trading in food commodities. Just at the time the Forward Markets Commission was established in 1953, the government felt that derivative markets increased speculation, which led to increased food costs and price instabilities. In 1953 it finally prohibited options- and futures-trading altogether. The restrictions were not lifted until the 1980s. In the United States of America, following passage of the Dodd-Frank Wall Street Reform and Consumer Protection Act of 2010, the Commodity Futures Trading Commission (CFTC) has proposed regulations aimed at limiting speculation in futures markets by instituting position limits. The CFTC offers three basic elements for their regulatory framework: "the size (or levels) of the limits themselves; the exemptions from the limits (for example, hedged positions) and; the policy on aggregating accounts for purposes of applying the limits." The proposed position limits would apply to 28 physical commodities traded in various exchanges across the US. Another part of the Dodd-Frank Act established the Volcker Rule, which deals with speculative investments of banks that do not benefit their customers. Passed on 21 January 2010, it states that those investments played a key role in the financial crisis of 2007–2010. The Tobin tax is a tax intended to reduce short-term currency speculation, ostensibly to stabilize foreign exchange. In May 2008 German leaders planned to propose a worldwide ban on oil trading by speculators, blaming the 2008 oil price rises on manipulation by hedge funds. On 3 December 2009, Representative Peter DeFazio, who blamed "reckless speculation" for the 2008 financial crisis, proposed the introduction of a financial transaction tax, which would have specifically targeted speculators by taxing financial-market securities transactions. Gunther, Max The Zurich Axioms Souvenir Press (1st print 1985) ISBN 0-285-63095-4. Neill, Humphrey B. The Art of Contrary Thinking Caxton Press 1954. ^ Stäheli 2013, p. 4. ^ Szado, Edward (2011). "Defining Speculation: The First Step toward a Rational Dialogue". The Journal of Alternative Investments. CAIA Association. ^ "CFTC Glossary: A guide to the language of the futures industry". cftc.gov. Commodity Futures Trading Commission. Retrieved 28 August 2012. ^ "Staff Report on Commodity Swap Dealers & Index Traders with Commission Recommendations" (PDF). U.S. Commodity Futures Trading Commission. 2008. Retrieved 27 August 2012. ^ Graham, Benjamin (1973). The Intelligent Investor. HarperCollins Books. ISBN 0-06-055566-1. ^ Nicholas Kaldor, 1960. Essays on Economic Stability and Growth. Illinois: The Free Press of Glencoe. ^ Teeter, Preston; Sandberg, Jorgen (2017). "Cracking the enigma of asset bubbles with narratives". Strategic Organization. 15 (1): 91–99. doi:10.1177/1476127016629880. ^ a b Hollander, Barbara Gottfried (2011). Booms, Bubbles, & Busts (The Global Marketplace). Heinemann Library. pp. 40–41. ISBN 1432954776. ^ Lei, Noussair & Plott 2001, p. 831: "In a setting in which speculation is not possible, bubbles and crashes are observed. The results suggest that the departures from fundamental values are not caused by the lack of common knowledge of rationality leading to speculation, but rather by behavior that itself exhibits elements of irrationality." ^ Rosser, J. Barkley (2000). From Catastrophe to Chaos: A General Theory of Economic Discontinuities: Mathematics, Microeconomics, Macroeconomics, and Finance. p. 107. ^ a b Shiller, Robert J. (23 July 2012). "Bubbles without Markets". Retrieved 29 August 2012. ^ Siegel, Journal (2003). "What Is an Asset Price Bubble? An Operation Definition" (PDF). European Financial Management. 9 (1): 11–24. doi:10.1111/1468-036x.00206. ^ Dr. Stephen Spratt of Intelligence Capital (September 2006). "A Sterling Solution". Stamp Out Poverty report. Stamp Out Poverty Campaign. p. 15. Retrieved 2 January 2010. ^ Chua, J. H. and R. S. Woodward (1983). "The Investment Wizardry of J.M. Keynes". 39. Financial Analysts Journal: 35–37. JSTOR 4478643. ^ Compare: Valente, Marcela. "Curbing foreign ownership of farmland." IPS, 22 May 2011. "The governments of Argentina, Brazil and Uruguay are drafting laws to curb acquisition by foreigners of extensive tracts of their fertile agricultural land. [...] China, Egypt, Japan, South Korea, Saudi Arabia, India, Bahrain, Kuwait, Oman, Qatar and the United Arab Emirates are all buying or leasing fertile land in other countries where food is not always abundant, the Grain report says. The study says Cambodia, which receives aid from the World Food Programme, has leased rice fields to Qatar and Kuwait, while Uganda has granted concessions on its wheat and maize fields to Egypt, and interested parties from Saudi Arabia and the United Arab Emirates are making approaches to the Philippines." ^ Frida Youssef (October 2000). "Integrated report on Commodity Exchanges And Forward Market Commission (FMC)". FMC. ^ "Speculative Limits". U.S. Commodity Futures Trading Commission. Retrieved 21 August 2012. ^ "CFTC Approves Notice of Proposed Rulemaking Regarding Regulations on Aggregation for Position Limits for Futures and Swaps". U.S. Commodity Futures Trading Commission. Retrieved 21 August 2012. ^ David Cho and Binyamin Appelbaum (22 January 2010). "Obama's 'Volcker Rule' shifts power away from Geithner". The Washington Post. Retrieved 13 February 2010. ^ Evans-Pritchard, Ambrose (26 May 2008). "Germany in call for ban on oil speculation". The Daily Telegraph. The Daily Telegraph. Retrieved 28 May 2008. Lei, Vivian; Noussair, Charles N.; Plott, Charles R. (2001). "Nonspeculative Bubbles in Experimental Asset Markets: Lack of Common Knowledge of Rationality Vs. Actual Irrationality" (PDF). Econometrica. 69 (4): 831–859. doi:10.1111/1468-0262.00222. JSTOR 2692246. Stäheli, Urs (2013). Spectacular Speculation: Thrills, the Economy, and Popular Discourse. Stanford, CA: Stanford University Press. ISBN 978-0-804-77131-3. Look up speculation in Wiktionary, the free dictionary.